The furor over the Trump boys” African hunting safari is another sickening example of twisted leftist luminaries” double standards. Never to be caught napping when an opportunity arises to ride an emotional bandwagon, they seized the chance to throw their weight behind the predictable outrage that follows when a rich white boy with a famous father is pictured brandishing a slain elephant’s severed tail. The PC proles came out screaming for Trump’s tail. All this in face of the fact that this hunt was (as far as can be ascertained from the relevant Zimbabwean authorities) entirely legal and part of a quota that generates the revenue that safari companies require to maintain a protective presence in these sensitive areas. The safari operators, who are the de facto custodians, can only survive with the support of people such as the Trumps. This is dysfunctional Africa, where the central governments offer little protection as official guardians of their natural resources. In many cases the authorities are so corrupt they join with those who seek to plunder. This is what has happened throughout postcolonial Africa and continues to this day. It is the real reason why Kenya stopped commercial hunting of this nature: Ivory-hunters were a thorn in the side of the political fat cats who wanted the ivory. Safari-hunting was summarily stopped and the anti-hunting do-gooders cheered. The Trump safari, like most, offers direct benefits to the impoverished local tribespeople in the form of meat and money. This is the tradeoff with them to restrain their tendencies toward wanton killing. If the hunting companies don”t survive, the masses move in, there is uncontrolled slaughter, and everything is killed. A topic the mainstream media avoids is how much devastation of wildlife and the habitat has been wrought by those they have so vehemently championed as African “liberators” and “freedom fighters” through the last decades. Sources tell me that conservation tragedies have been unfolding throughout Africa under cloak of secrecy and with full dictatorial endorsement: tens of thousands of buffalo slaughtered in Mozambique under President Samora Machel’s watch; similar numbers of elephants slaughtered in Tanzania with the blessing of President Julius Nyerere, reportedly in exchange for Chinese support; and black rhinos being nearly liquidated in Zimbabwe under Mugabe. Helping hammer nails into the conservation coffin are the misguided philanthropists who continue pouring money into boosting African population growth. Few are more committed and generous in this questionable cause than Bill Gates and Warren Buffett, but Bono adds a raucous voice. A scrum of celebrities follows behind, jockeying for the liberal limelight. Thanks in no small way to them, it seems certain that continental population growth will continue to outstrip the people’s ability to sustain themselves. This will lead to an ever-increasing demand for food aid and a miserable spiral of slash-and-burn agriculture leading to desertification. 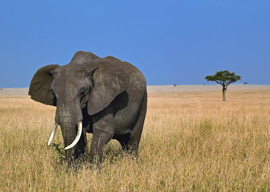 The protein deficit will be cut in part by poaching wildlife on a grand scale. Barring some sort of divine intervention, this scenario now seems certain and Africa’s wildlife and natural splendor is doomed. It need not be this way. Family planning, progressive agriculture and animal husbandry, urbanization, and managed exploitation of wildlife can reverse this process. But this is highly unlikely. The politicians, media moguls, and celebrities lack the moral fiber to take the correct, courageous approach. It’s far easier to offer the audience the cheap thrills they lust for and to dodge the danger of doing what is right. The Trump saga is yet another example of how selective, vindictive, and reckless the media and their acolytes are. Africa needs more Trumps and fewer Buffetts and Bonos.